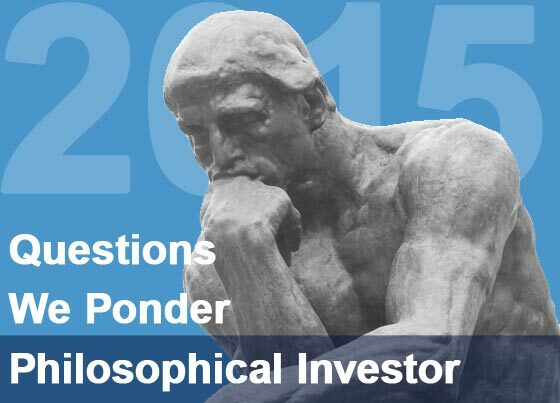 As 2015 opens, like many of you, there are numerous questions I am pondering. How will lower oil prices impact apartment demand, particularly in Houston? Will lower oil prices lead to more conflict in the Middle East engineered by Iran to retaliate against the Saudis and/or to create supply disruptions? Will some American shale producers be able to lower their costs significantly to be profitable at $50 per barrel oil? Will enough supply be cut and/or demand stimulated to push prices higher? My 2015 Question. Will the stronger dollar create a debt crisis in emerging market countries that have borrowed very heavily in dollars? Will the prospect of a strengthening dollar influence the Fed in terms of whether to raise short-term interest rates? Can the Fed really move aggressively on raising short-term rates given the strength of the dollar, the relative weakness of the rest of the world, sub-par wage growth, and long-term interest rates that are among the highest in the world? What will happen to long-term interest rates? Here’s a sneak peek in terms of what I think based on the results of a Bloomberg survey. The title of the article was U.S. Bond Sentiment Worst Since Disastrous ’09 where the survey results were released. With Federal Reserve Chair Janet Yellen poised to raise interest rates in 2015 for the first time in almost a decade, prognosticators are convinced Treasury yields have nowhere to go except up. Their calls for higher yields next year are the most aggressive since 2009, when U.S. debt securities suffered record losses, according to data compiled by Bloomberg. Getting it right hasn’t been easy. Almost everyone who foresaw a selloff this year as the Fed ended its bond buying was caught off-guard as lackluster U.S. wage growth and turmoil in emerging markets propelled Treasuries to the biggest returns since 2011. Now, even as the bond market’s inflation outlook tumbles, forecasters are sticking to the view that Treasuries are a losing proposition as the economy strengthens. The median forecast calls for yields to reach 3.01 percent during the same span. The roughly 0.75 percentage point increase would be almost twice as much as forecasters anticipated for 2014. Combined with projections for yields on the two-year note to more than double to 1.53 percent and those on the 30-year bond to rise 0.89 percentage point to 3.70 percent, the prognosticators are more bearish than any time since heading into 2009. Given the chance to speculate on declines in only one asset, 20 percent of investors, traders and analysts in a Bloomberg Global Poll conducted last month picked government bonds as their top choice — the most of any category. Given the overwhelmingly bearish sentiment towards U.S. Treasuries, history would suggest that they will perform much better than the consensus is forecasting. Junk bond spreads have been widening due to a perceived weaker global economy and the carnage in the valuation of energy companies, which have been big high-yield borrowers. Will spreads continue to widen in 2015? If spreads do widen, then will the spillover materially to real estate borrowing costs? Will single-family home sales increase materially in 2015? How will apartment demand be impacted if single-family does improve? Will more home construction and the corresponding job growth benefit apartments more than the enhanced competition from a new single-family building? How will the lower down payment thresholds for some borrowers now being allowed by Fannie Mae and Freddie Mac impact apartment demand? Will job growth continue to progress at approximately 2%? Will the American consumer spend much of the cost savings generated by lower fuel prices? How will lower oil prices impact U.S. economic growth now that there has been a significant increase in domestic energy production over the last three years? What will a Republican-controlled Congress propose to do, if anything, with Fannie Mae and Freddie Mac? Will there be any pressure to repeal the 1031 exchange? Will there be any material changes to our tax laws? How will Russia respond geopolitically to much lower oil prices, tremendous economic pressure, sanctions, and increasing international isolation? Will China’s growth rate continue to slow and keep the pressure on commodity prices and overall global growth? Will Greece trigger another Euro crisis? This was more of a stream of consciousness exercise and is by no means an exhaustive list of questions. Feel free to share some of your own with me that you think are pertinent that I overlooked. ‹ Can Money Buy Happiness? Rethinking Your Resolution? Where the median economic forecast tabulated by Bloomberg for the 10-year U.S. Treasury Bond yield for year-end 2015 currently stands at 3.24%, Gundlach thinks the 10-year that finished 2014 at 2.17% could potentially take out its modern-era low of 1.38% yield hit in 2012. This would particularly be the case if crude-oil prices keep falling to, say, $40 a barrel from their 2014 year-end level of about $55. This further drop from the 46% decline suffered by crude in 2014 would only accentuate deflationary forces he sees at work globally that continue to drop long-bond yields. Michael, I agree completely and I believe the bond market is already reflecting that. There is a bit of a yin and yang, however, as more buying power due to lower energy prices can accelerate economic growth while less buying power in the oil patch and among oil exporters could offset that. Overall though I think the drop represents less demand than anticipated among oil consumers which is reflective of a less than robust global economy.